This is the divorced choke set-up for the Performer intake. This is a Chevy unit removed from a 72 Impala. 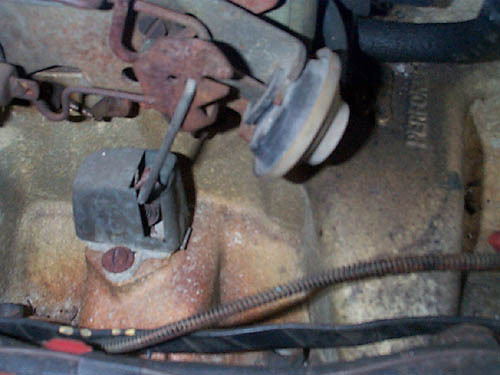 Both 2 and 4 bbl Chevy engines use this choke. 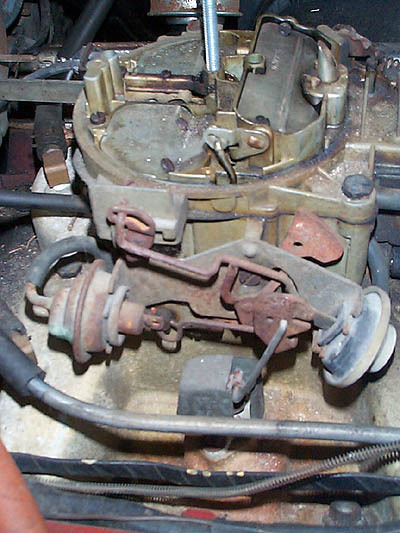 This one was from a 2bbl and the choke rod to the carb was shortened and rebent. Also, notice the slot cut into the side of the choke cover. 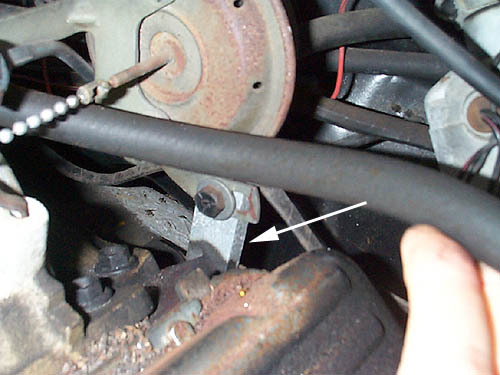 Without it, the rod was contacting the cover and the friction prevented the rod from closing the air blades. Here is the choke rod placed in the STD hole. The hole to the left is stamped ALT. Engine is cold and the rod is up closing the air blades. This is the factory 1970-2 cruise control set-up. 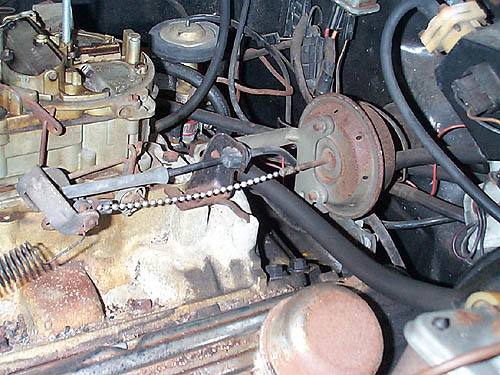 The vacuum motor with the ball chain has a brkt which screws to the throttle cable holder. This keeps the pull chain in a straight line. In order to keep the pull chain in a straight line, I had to fabricate this small bracket(white arrow) from some square aluminum bar stock. The vacuum motor need to be raised about 1.5". If you bolt this vacuum motor in the stock location (directly to the back of the head) You will not be able to line up the vacuum motor bracket to the throttle cable holder. In order to install a PCV valve, use HELP 42049 and any 3/4" PCV such as PCV1124 both are available from Autozone.